Okay - I have to admit I'm not 20, but I've moved into the Techno Age in a pretty major way. 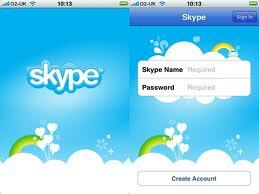 One thing I became enamoured of is Skype. I had one son living in Ireland and a daughter living in Australia for a year. While it was tough to organize a time to talk because of the different zones we were in, talk we did. In fact family get-togethers always included calls from both of the kids at different times. We would place the lap-top in the centre of the gathering and everyone would get an update on how their travels were going. It made us all feel closer to them and gave us a sense that the world was just that little bit smaller. 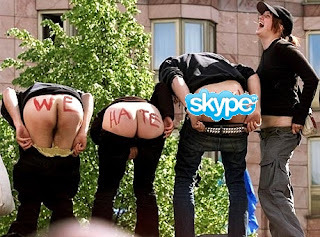 Because I am a freelance writer with a limited budget, Skype has opened the door to me interviewing artists in other areas as no cost - a real plus. I also didn't need to purchase a recorder for my phone to tape the calls. An expense I just couldn't justify. Skype interviews I have conducted include a Los Angeles fashion stylist, three designers in New York and a tap icon living in Toronto. That chance to talk and interact with what is being said live, even though there are limitations, is a blessing. Seeing the artist talk also brings an added dimension. The article is stronger and has a better sense of the designer embedded in the words. I just place my tape recorder on my computer's speaker and interview away. There has been a major surprise, though. Never once in communicating with my kids in Ireland or Australia did I have a single problem on Skype. The connection was great, even though they lived in meagre circumstances, and conversations went uninterrupted. Since interviewing artists in Canada and the U.S. I have been shocked at the low quality of the Skype connection. One of us keeps losing the audio and every time we have had to restart many times. In one interview that was unusually poor, we had to leave the video off entirely to keep the connection to make any progress and still had to re-start three times. Okay - I don't hate Skype, but when I have to restart 3 times, I understand the sentiment. 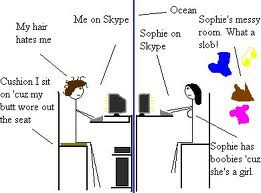 Which brings up the question, why is Skype better when you call someone on another continent than when you call someone in the North America???? I have tried an internet search to no avail, so here is your chance. If you can answer this question and it has a solution, you have improved my future interviewing experience by 100% and will earn my undying appreciation.